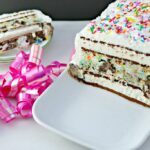 Layered with ice cream sandwiches, creamy Great Value Birthday Party Ice Cream and crunchy, fudge cookies, this cake is a decadent finish to any meal. Plus, it’s a great make-ahead dessert and can be stored, frozen in an airtight container for up to a week. Place ice cream in fridge to soften for 30 min. In a small bowl, mix cookies with chocolate topping. Invert a rimmed baking sheet (to act as a guide for cake layout) and lay 2 sheets of plastic wrap next to one another overlapping slightly to create a base to wrap the cake. In the centre of the plastic wrap, working quickly, lay 4 ice cream sandwiches side by side lengthwise to create a rectangle base Spoon 2 cups, (about 4 ½ cup scoops) ice cream over top, lightly pressing to flatten evenly to edges of sandwiches with a spoon. Spoon chocolate mixture over top, spreading to within ½ - inch of edge. Repeat ice cream layer and top with remaining ice cream sandwiches. Fold plastic wrap over to completely seal the cake. Lightly press ice cream sandwiches down to flatten and adhere to ice cream and press ice cream in to ensure cake maintains its rectangular shape. Freeze until firm, about 4 hours. Unwrap cake, spread evenly with thawed whipped topping and decorate with sprinkles. Place in freezer until whipped topping is firm, about 2 hours. Remove to a serving tray. Slice and serve immediately.